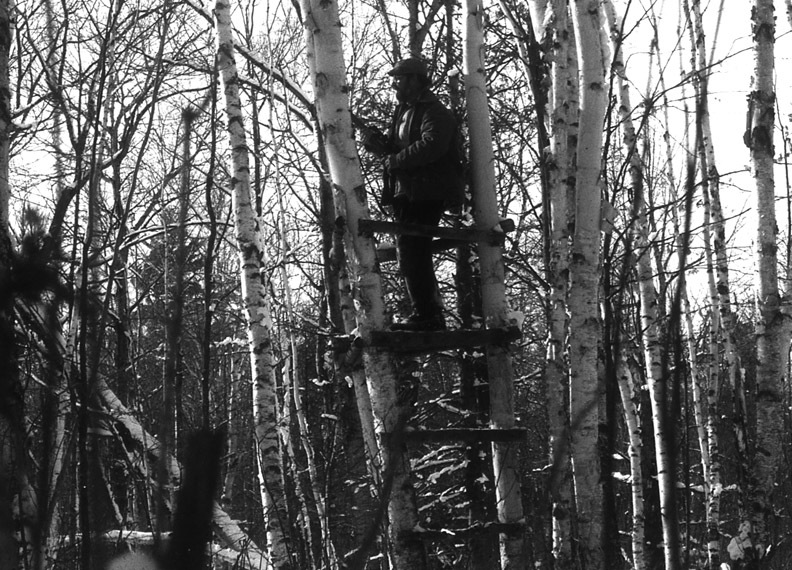 Doc demonstrating an early, natural, tree stand. Cover scents are preparations that emit strong (often eye-watering), natural odors, such as apple, acorn, evergreen, fox urine, skunk musk, buck musk and deer urine. They are intended to overwhelm human scents without alarming deer. [Of course, due to Doc's research, it is now known that overwhelming a whitetail's sense of smell is not possible.] Those that alter human scents, such as SCENT SHIELD, reduce or eliminate human odors by making them less or non-volatile. 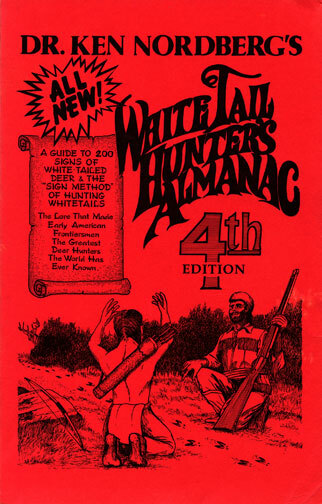 As is typical of just about everything with whitetail hunting, many hunters use these potions in ways that significantly reduce their effectiveness. 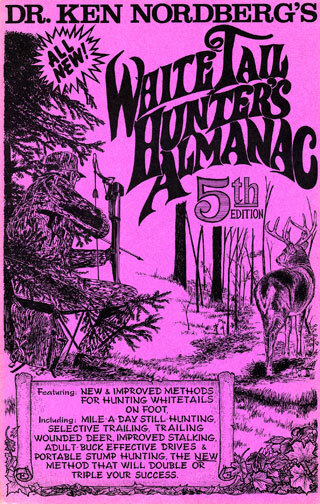 In fact, some use them in ways that practically guarantee they will see no deer. Based on my nine years of testing many of these products on wild whitetails, here are some tips to help you get the most from them. 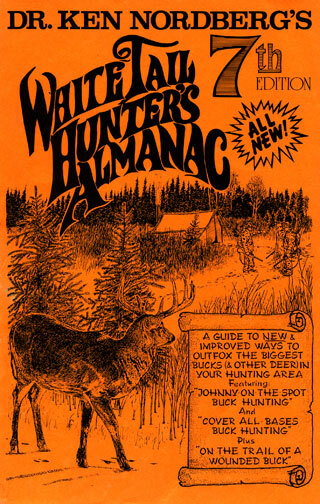 First of all, remember two commonly disregarded facts; it's a wonder how any of these products can effectively suppress the odors of average hunters. To make them work, the hunter must first make a conscious effort toward eliminating or minimizing personal odors. Even then, they are not perfect. No scent, I believe (even skunk musk), can completely cover all common, human-related odors. 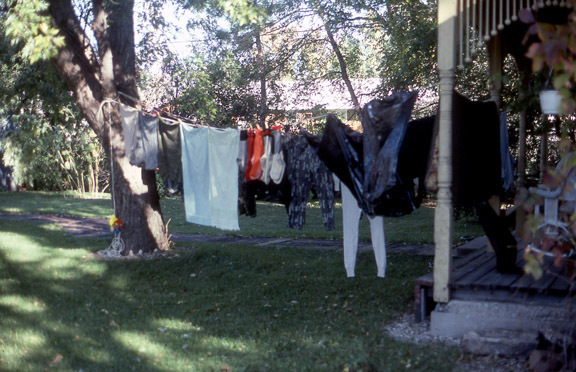 As a result of Doc's scent research — every year — Doc religiously washes his hunting clothes at least 2 weeks before the season, in scentless soap, and then hangs them outside to minimize their odors. Then he stores them in plastic bags, also washed in scentless soap. He never wears his outerwear when food is being cooked in camp, or into a local sportsmen's bar (where it would collect the many unnatural scents — like from cigarettes). Take fox urine, for example, I depend on its pungent scent year-round to get closer to deer with my camera. 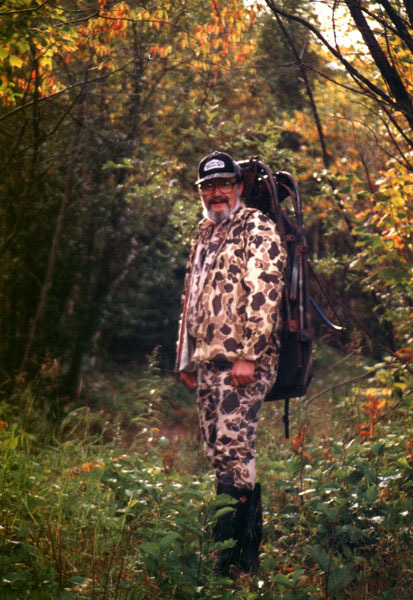 Within my primary study area several years ago, one wild buck I stalked and surprised came to within 30 yards a few times previously, walked freely along a selected trail I had used only an hour before (plenty of fox urine on my rubber boots). Upon moving to within 10 yards of a deliberately hidden, much-handled cloth laced with fox urine, however, it reacted with alarm, quickly leaving the area. During the hour before this happened, three adult does passed the hidden cloth, displaying no more than a brief and mild curiosity. The does had not learned what the buck had learned: Don't trust the odor of fox urine when accompanied by strong human scent. 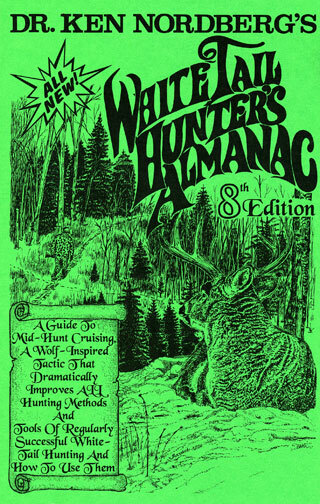 Since the 1970's, mature white-tailed deer have learned to look for, and identify via scent, hunters in elevated stands. They have also learned to associate the use of cover scents with hunting humans. 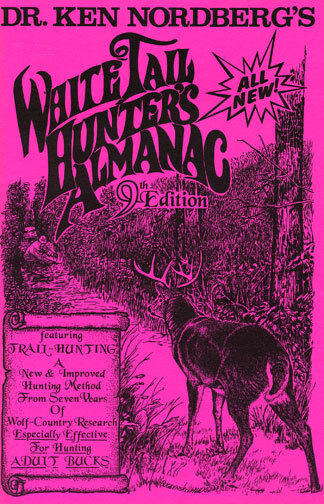 Many of the deer that did not learn about these dangers were harvested by hunters. 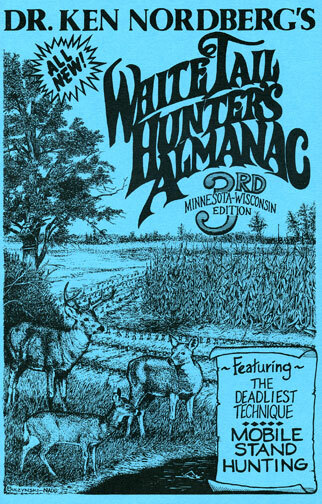 The smarter deer that learned of these dangers were more likely to have survived, and have passed down the ability to avoid these dangers to our current generation of smarter whitetails. 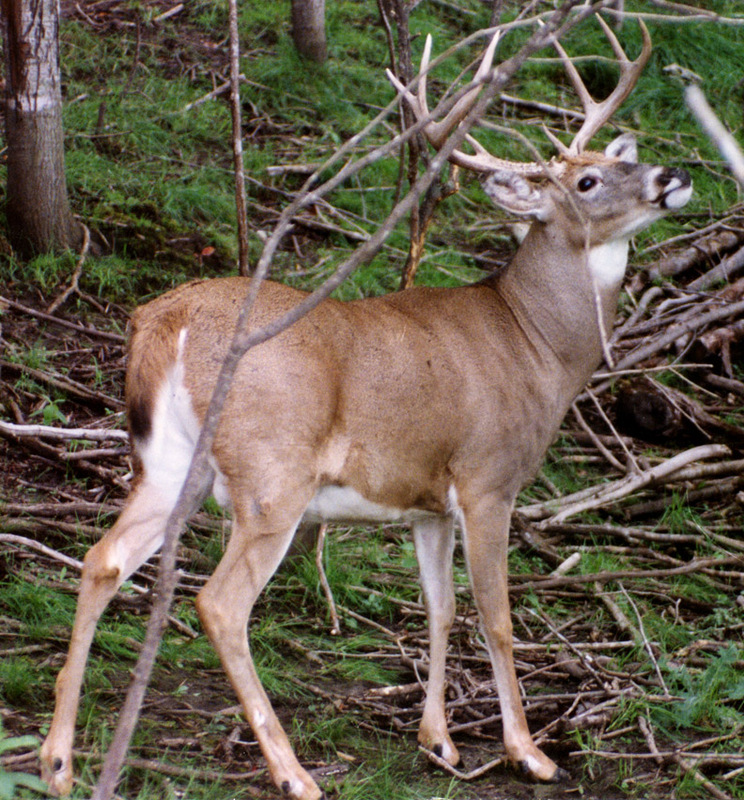 Another fact to keep in mind is, the best cover scent cannot work when a deer has you pegged via sight or sound. When you're working close to a deer fooled by your scent, you must use all the stealth (and cover) you can muster. The reason fox urine (and some other scents) works, I believe, is because it creates a false sense of security. It might be better described as a confidence scent. When a whitetail suddenly smells fox urine accompanied by a modest human scent, the deer characteristically becomes sensitive to the alarm calls and actions of other wildlife. It seems to come to the conclusion a human simply cannot be there (even though its scent somehow got there) because the fox it thinks it smells (and hears) would definitely not be there if a human was in the same vicinity. The fox would be running, not quietly doing what it seems to be doing. The ability to create a false sense of security, I believe, is the criterion of an effective cover scent. Fresh cow manure (where cows are common) and coyote, raccoon and even deer urine (without attracting pheromone) are examples of strong, completely-natural odors that can convince a whitetail the airborne human odors it smells must be wayward; a false warning; nothing to worry about. Apples, acorns and evergreen boughs lack this effect because they do not warn birds or animals to react to danger.